Remember the magical Marauder’s Map from the Harry Potter books that reveal the whereabouts of characters as they roam classrooms and the halls of Hogwarts school? A student developer from Cambridge has created a Chrome extension that works similar and also named it Marauder’s Map. The extension that allows you to watch every footstep of your Facebook friends by grabbing location data from Facebook Messenger and rapidly plotting your friends’ locations on a map. We all are aware that Facebook shares our location data with our friends, however, what we probably aren’t aware of the accuracy of that data and easiness of extracting that data from the messaging service. Facebook usually encourages Messenger users to share their location by enabling location sharing by default when users install iOS or Android app. 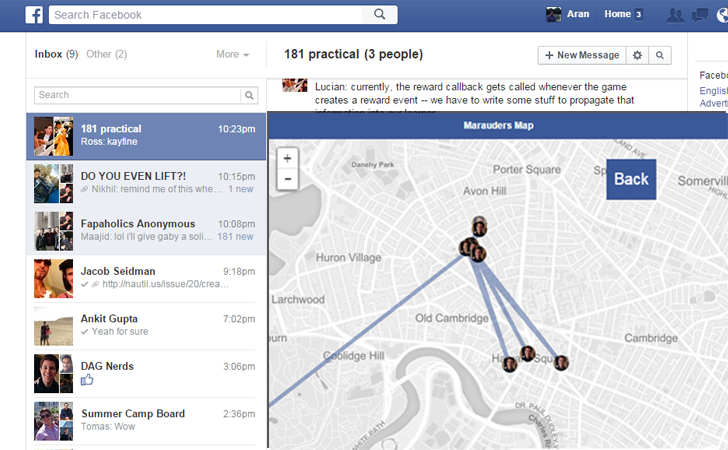 Software developer Aran Khanna’s extension dubbed Marauder’s Map, loads the map in Messenger’s Web interface and fetches the data from messages sent over Facebook Messenger with location sharing enabled. If you are in doubt that this extension could easily track all your location data, then you are wrong. The extension will able to map your location only for those instances when you have had a conversation with your friends over Messenger with location enabled. The extension will not be able to get your location in between these instances when you have not used Messenger at all. It’s not completely Facebook's fault because the service is only providing you a feature to share your locations with your friends, neither your friends (maybe you as well) are necessarily giving up their locations unknowingly. But, it is most likely that your friends are not realizing how accurate this location data is and how easily this information can be used. They just click through to get chatting with their friends. If you don’t want to share your location with your friends and keep your location data private, then you can disable location sharing feature by tapping the arrow icon in your Messenger, or simply go into the settings of your phone and disable Messenger’s location access altogether.